Entrepreneurial thinking, organizational innovation, cross-sector action. Management tools and principles are equally applicable in for-profit and not-for-profit organizations. IO-MBA coursework adapts universal management concepts to the context of IOs, equipping students to thrive in a not-for-profit environment while still preparing them to understand and work with the for-profit world. IO-MBA participants hail from diverse backgrounds, and their combined wealth of experience contributes to a collaborative, multi-sectoral classroom environment. This type of cross-sector cooperation is crucial to achieving the SDGs by 2030, which will require collaboration between governments, business, and civil society. Although IOs may seem like closed systems from the outside, people transition in at all points in their career. Understanding IOs’ priorities, processes, and language will help you make the transition smoothly. IO-MBA prepares participants to apply business and management tools in the specific context of IOs, while its robust career services supports students in building their network. IOs are undergoing major transformations. Reforms in innovation and digitalization are creating new jobs, resulting in the need for new talent. Staying competitive in this market requires fresh approaches and being open to doing things differently. To achieve the Sustainable Development Goals, IOs need employees with an appetite for innovation, collaborative mindset, and interest in cross-sector problem-solving. Myth #4 - "There is no budget for external training in IOs"
Many IOs support their staff with financial contributions or days off for training and continuing education! International Organizations are changing rapidly and as some opportunities close, others open. Creating a network and acquiring key leadership competencies can help you move to the next step of your career, within or across organizations. Myth #6 - "International Organizations don’t value management education"
While most IO staff are highly educated, a unique degree will help you stand out from the crowd. Organizations are transforming and recognizing the value of transferable management skills. A comprehensive understanding of strategy, finance, and nuances of management will only augment your specialist skills. Check out IO-MBA's new report, "Unleashing bottom-up innovation in International Organizations". UN agencies are part of the broader landscape of international organizations, which includes bilateral and multilateral agencies, NGOs, governmental agencies, private cooperative agencies, and global partnerships. IO-MBA coursework prepares graduates to dive into any part of this dynamic ecosystem. 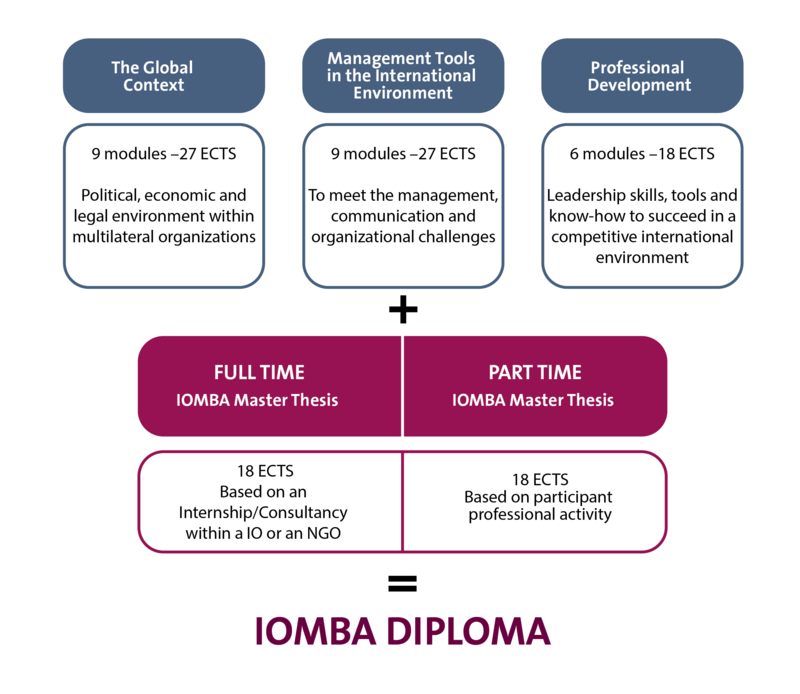 Why choose IO-MBA? Are you a professional working for – or aspiring to work for – IOs, NGOs, nonprofits, or social enterprise? IO-MBA provides you with perspectives from these different worlds and hands-on experience from practitioners and faculty for a true cross-sector experience. IO-MBA's career services programming includes small group workshops and individual consultations; our personalized approach connects participants with the networks and resources they need for career growth. The future talents will be “Cross-Sector Experts”: leaders who master business management tools combined with a deep understanding of the context of international organizations and NGOS. Join IO-MBA and become such a leader! Scholarships available, contact us for more info.